This is not a prank! I Just stumbled across this when videos by the YouTube user?? 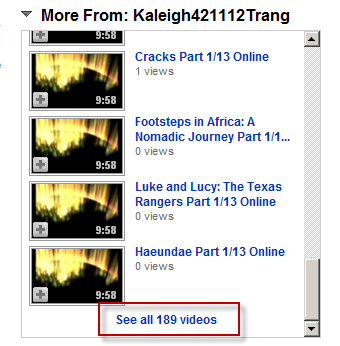 Kaleigh421112Trang suddenly showed up in my subscriptions (based on Keywords) for my CirqueDuSoleilGuru account. I made the URLs that are not hyperlinked this way on purpose, to prevent any accidental harm to the readers. You can copy and paste the URLs into your browsers address bar, if you know what you are doing at your own risk. Don?? ?t say that I did not warn you! By now this user has already 190 virtually identical videos uploaded that don’t show much, except a message that the video cannot be watched on YouTube due to length limitation. See description for link to full video. etc. Here is a screen shot of it. The page states that a plug-in must be downloaded to watch the video. It includes multiple links where you are supposed to download the needed plug-in from, such as this one (Warning! Do not Download and Execute)! The referred to EXE ???vlcsetup.exe??? is 328,984 bytes in size. The file name is implying that the plug-in is related to the freeware VideoLan Video Player, what it is not. I downloaded the executable without starting it. I then scanned it with McAfee Viruscan, which did not detect anything yet. So I uploaded it to VirusTotal.com, an online on-demand virus and malware scanner, which scans files using over 50 different scanners such as McAfee, F-Secure, Bitdefender, Kaspersky, Panda, PC-Tools, Sophos, TrendMicro and others. I wasn?? ?t the first one who checked the file obviously, because a report was already available*, which gives it a 37% probability that it is infected. It is probably new and I bet the probability will increase as I write this (as do the uploads of virtually identical videos with the same purpose to YouTube). Here is the link to the report from VirusTotal.com. There are most certainly a lot more, but they should be easily be detected. Look for new users that have hundred+ videos of 9:58 minutes length and a TinyURL.com link in the video description. The target website itself lists tons of copyrighted movies on its homepage. Also suspicious, the detail page of every movie has the same comments to give the impression that people watched the movie etc. 3rd link worked perfectly and fast mirror. I liked it. Thanks for the upload! Never mind. I just downloaded the plugin and the video worked flawlessly! The uploads are done on a large scale and with sophisticated scripts to dynamically create typical titles with matching descriptions in YouTube. YouTube also has a dupe checker that identical videos cannot be uploaded by the same account (at least used to be it that way). But changing a single byte is already enough to get around it. That?? ?s probably all these guys did, because the videos appear to the human viewer identical. They also show all the same Thumbnail, which should raise suspicion by any user of YouTube with some working brain cells left (That is how I got suspicious). The hackers are obviously not sophisticated enough though, because they did not seem to have taken into account the problem with identical thumbnails that will appear in the box with ?? ?more videos by ?????? but also in the ?? ?related video box??? where I got the other user names from. Because the videos are similar in some fashion, YouTube thinks that they are related. It is very very hard to produce identical thumbnails for videos that are not identical. In the early days YouTube used frames that could be predicted in advance (and was used for manipulations by users). This isn?? ?t possible today anymore. I would not be surprised, if similar scams will pop-up in the future more and more, also on other smaller social networks and video sharing sites. Those scams will also get more and more sophisticated and users will be vulnerable until their Antivirus/Antispyware software will be updated to detect those new threats that will emerge and then disappear again quickly. NEVER download and install a plug-in where you don?? ?t know and trust the source. Installing a malicious plug-in is like unlocking the door, disabling the alarm and then open it to invite the burglar in to have a look around and take whatever he likes.?? Almost all video sharing sites use FLASH for the video playback. The Flash plug-in should only be downloaded from the Adobe.com web site (and not from anywhere else). Be Careful, without getting paranoid. Use common sense and caution where appropriate. Unfortunately not everybody on the Internet has the safety and happiness of the users in mind. Besides the more obvious fraud parts of the video (the repeated comments, etc), a poke at the site code reveals that no video is even attempted to be loaded (the querystring is just a dummy) and the form to submit comments doesn’t even go anywhere. Hey, I?? ?d personally love to say the fact that my partner and i enjoy your way of writing. It?? ?s simple to discover the reason you have a lot of feedback on the web page. in any case great job with your blog. Hello there, I would love to say the fact that i love your actual writing style. Its simple to realize why you have a lot of views on your weblog. at any rate well-done with your blog. As a Ubuntu linux user, I feel pretty safe. I suggest you switch. Do you know what that executable file does? I accidentally (and stupidly) ran it when I was trying to download and install the VLC media player. I didn?? ?t realize I was at a fake site until it was too late and I downloaded and ran that file. When VLC did not install, I started to investigate and I realized that I was at a fake VLC site. I ran a virus scan but it didn?? ?t find anything. So do you have any idea what running that file might have done? And how to undo it?